You are here: Home / Recipes / Dessert Recipes / Cookies and Cream Blondies! 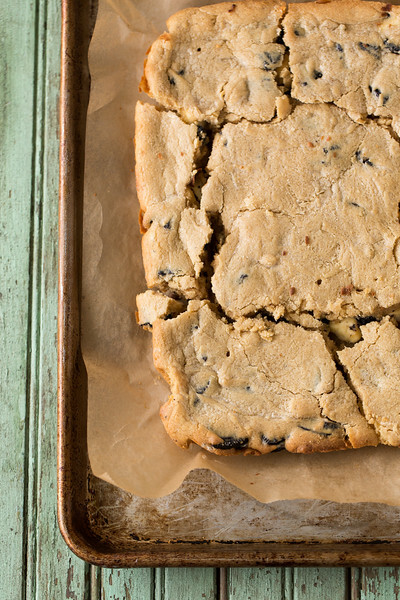 The best Cookies and Cream Blondies! Oreo cookies, cream cheese and white chocolate make a gooey, chewy Oreo cookie blondie that is so incredibly delicious and decadent! I don’t know about you, but I always thought of blondies as that second cousin that you never see. Sure, you might run into them every now and then at a family function and enjoy talking to them, but you don’t go out of your way to see them. That was blondies for me. They would pop up occasionally at some party or get together and I would eat them, because I never pass up a dessert. But I didn’t understand why anyone would want a blondie when they could have a brownie. I mean…why? Well, did you know that if you pick up a tray of barely cooled blondies by the edges of the parchment paper and walk them all over the house looking for the best light, that they will basically fall into each other, cracking into an interesting jigsaw puzzle blondie? Moral of the story is to always have them supported with some sort of pan underneath. Though, I actually liked them like this, no squared portion control, we were free to take big chunks of blondies! Speaking of portion control – good luck. As Mr. Sidewalk Shoes said, “These are addictive.” They are so insanely good. The cream cheese and the chunks of Oreo cookies create an oozy while simultaneously crunchy center and the white chocolate laced blondie portion is the perfect sugary sandwich for it! Seriously these were amazing! I found them in an old 2011 Donna Hay Magazine. More proof that you should never throw away your old cooking magazines! Brown Sugar – The difference between a brownie and a blondie is that a blondie is based on brown sugar and a brownie is based on cocoa. Vanilla Extract – I used Homemade Vanilla Extract. White Chocolate – melted. To melt white chocolate in a microwave – using 50% power, microwave for 30 seconds at a time. Stirring between times. Stop when most of the chips or chunks are melted and keep stirring, the rest will melt. If you have any leftover Oreo Cookies, be sure and make Cookies and Cream Popcorn! If you’re looking for more dessert recipes, be sure and follow my Pinterest Desserts Board. 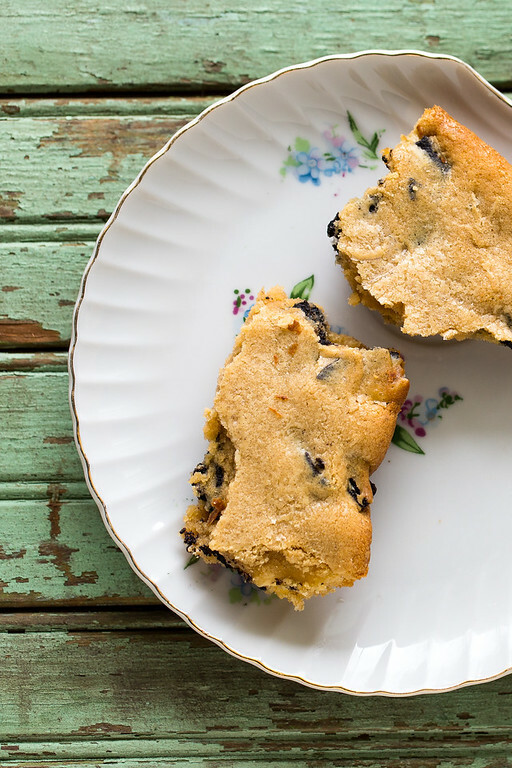 These decadent blondies are filled with cream cheese and oreo cookies, making them totally addictive! Beat the butter and sugar in the bowl of an electric mixture until pale and creamy. Gradually add the eggs, beating well after each addition, then add the vanilla. Add the flour, baking powder and chocolate and beat until combined. 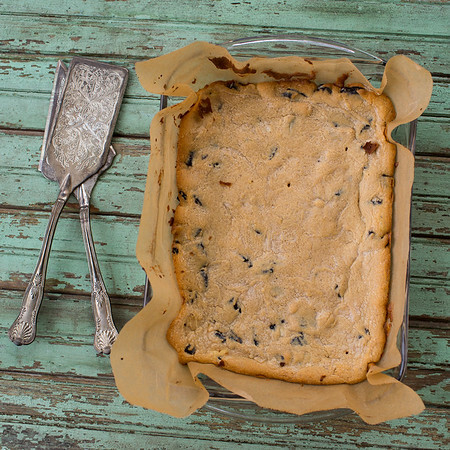 Spoon half the mixture into a lightly greased 12x8 baking pan lined with non-stick baking paper. Top with spoonfuls of cream cheese (I just sort of tore off bites of it). Sprinkle with the oreo cookies. Top with the rest of the dough and spread it to cover the cookies and cheese. Bake for 25-30 minutes or until it is cooked though when tested with a skewer. Allow to cool in the tin before slicing. To melt white chocolate in a microwave - using 50% power, microwave for 30 seconds at a time. Stirring between times. Stop when most of the chips or chunks are melted and keep stirring, the rest will melt. This post was originally published in 2015 and has been updated for 2019. You had me at cookies and cream! Fantastic recipe!! These sound amazingly yummy. I can’t wait to try them!! These sound divine, I love the pairing of white chocolate and Oreos. Who cares that they cracked, they all go down the same way! Cream, cookies, blondies! I’m there. May I have a glass of milk please? Very cute! These look delicious, and I luurve the photos!! Yes! 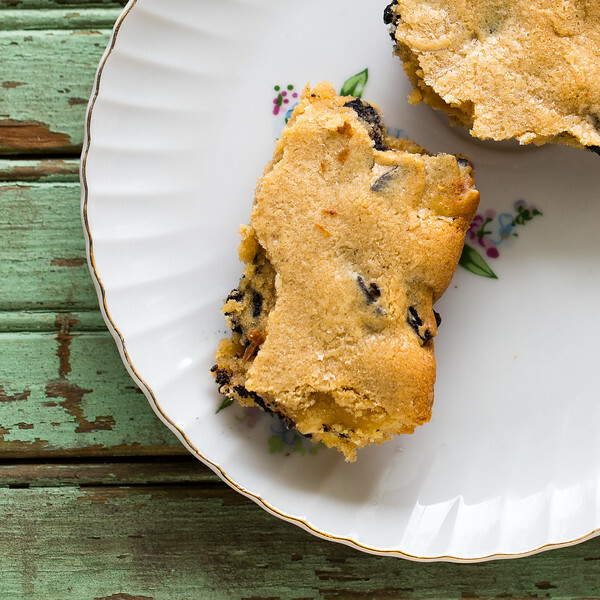 I laughed out loud since I can relate to carrying around freshly baked goodies while looking for the best light in the house– I usually hide my ragged-edged treats with a scoop of ice cream. : ) I could go for a tray of these cookies and cream blondies right now! Your problem trying to find good light for photographing the blondies made me laugh. And your blondies look wonderful even with their ragged edges – or maybe in part, because of them. Yum! I don’t think I’d be able to stop at 1, Pam!! These look awesome! Pinning and sharing! I’ve learned that lesson the hard way too, Pam. Fortunately, the little cracks don’t affect the taste! I can feel the calories jumping off your pictures and onto me! These look rich and decadent, and I love making bar cookies. These sound so good! I love desserts with Oreo’s in them, I’m a sucker for them. Too funny about them breaking up when you carried them around the house. I think the “rustic” cut makes the pieces interesting. So much for boring old squares. Ooooohhhh I’ve been there with the cracked brownies. But hey..at least now you get bigger squares than you probably would have cut for yourself! And I think it actually looks great in the photos. Very artistic.